One of the moments I’m happiest with in our new film is the scene where Jason Segel’s character Henry basically breaks up with his friend. Because his friend has come to believe some things Jason does not. It’s written like a real breakup. In the middle, there’s a moment where they both feel like, “Wait - what are we doing? We’re still us. This can’t be happening.” And they nearly stop the breakup. It’s moments like that which made me want to make this film. Years ago, I became aware that there was a huge gap between the way evangelicals are portrayed on TV and in films and in the news, and the evangelicals I know in my personal life. Who are not like the smiling, intolerant hardasses I see in the media, but complicated, sensitive, funny people who take seriously Jesus’s admonition to love one another. It seemed worthwhile to tell stories that try to portray a more complicated picture of this part of America. Which is, after all, huge. A fourth of the country. Hence this scene, where Jason’s character reaches out to his friend not as some Bible-thumping zealot, but out of love. 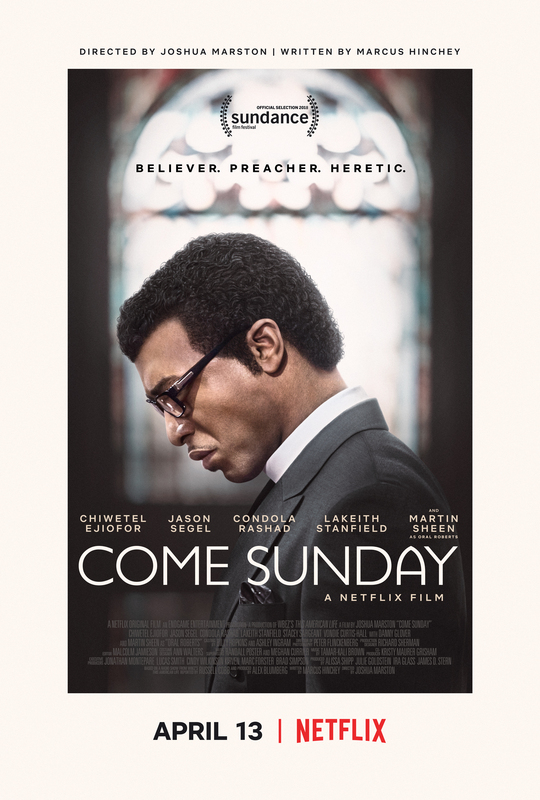 The film tells the real-life story of Carlton Pearson, who was a rising star in the Pentecostal church and Oral Roberts’s protégé. He started the gospel music South by Southwest (it was called Azusa). Then God spoke to him and told him that everyone gets into heaven, even people who don’t believe in Jesus. Carlton started preaching it, and – spoiler alert – it goes pretty badly for him. He loses most everything: his church, his fortune, his following, nearly his family. We first did a story about it in 2005. We were lucky to attract an incredible cast. Chiwetel Ejiofor plays Carlton. Martin Sheen plays Oral Roberts. Jason Segel, Lakeith Stanfield, Condola Rashad and Danny Glover round out the cast. Here's a video with the real-life Carlton. Fun fact: the stuff that Oral says to Carlton – even the stuff about his gay son – is stuff he really said in real life to Carlton. (Our screenwriter Marcus Hinchey spent hundreds of hours talking to Carlton.) Our director is Josh Marston, who’s best known for his amazing film "Maria Full of Grace." On Netflix now! Hope you like it!